Incredible Lake Balboa remodel on a huge 17,000 sq ft lot, 100 wide x 170 deep with a sparkling pool for those hot summer days. Brand new granite kitchen, remodeled baths, wood burning fireplace, family room, recessed lights, new French Doors, new paint inside and out, beautiful new tile floors, new carpeting, new landscaping, new block wall fence with gate for extra privacy and security, new driveway, new patio cover, newly reinforced carport. Room for RV parking access. A complete rehab top to bottom, a real beauty! 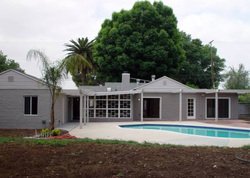 A great house for a family, entertaining, parties, kids, and pets. Lots of large mature trees including Eucalyptus, and towering Palms.